Everything must be ready and in place before you bring the guinea pig home. When it is all prepared, the guinea pig can be obtained from several sources. The first priority before you buy a guinea pig first make sure that the pet shop/breeder treats the guinea pigs well and live in a pleasant environment. Your first option should be animal rescue homes. These guinea pigs have more need for someone to care for them and they are equal to other guine pigs even though they may have had a difficult life. Nowadays there are many good pet shops. You should frequent the sort that are obviously well-run with sparkling, clean spacious cages for the guinea pigs on sale and staff who gladly answer any questions you may have. If you have any doubts concerning matters of health, speak to your veterinary surgeon before making a purchase. 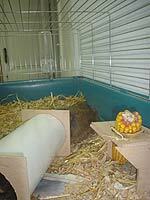 Other sources of guinea pigs are hobbyists and breeders. You can find the guinea pigs in clubs and societies or in the advertisement columns of specialist magazines and periodicals.